The major reason we recommend Mason-type canning jars is our experience with them and their decreased rate of breakage in comparison to mayonnaise jars, salad dressing jars, spaghetti sauce jars or other jars not intended for canning. Home food preservation experts have worked with various types of canning jars and their experience is reflected in the following long quote from the National Center for Home Food Preservation. “Food may be canned in glass jars or metal containers. Metal containers can be used only once. They require special sealing equipment and are much more costly than jars. 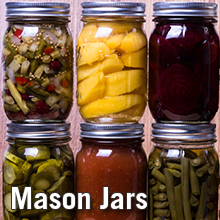 “Regular and wide-mouth Mason-type, threaded, home-canning jars with self-sealing lids are the best choice. They are available in ½ pint, pint, 1½ pint, quart, and ½ gallon sizes. The standard jar mouth opening is about 2-3/8 inches. Wide-mouth jars have openings of about 3 inches, making them more easily filled and emptied. Half-gallon jars may be used for canning very acid juices. Regular-mouth decorator jelly jars are available in 8 and 12 ounce sizes. With careful use and handling, Mason jars may be reused many times, requiring only new lids each time. When jars and lids are used properly, jar seals and vacuums are excellent and jar breakage is rare. Another advantage of using canning jars is that they generally have a consistent shape and hold a consistent volume. Shape and volume affect the rate of heating of the food in a jar. It takes longer to heat the coldest point of food to the desired temperature in larger volume jars than it does in smaller volume jars; it takes longer to heat every particle of food in a fat jar than in a tall skinny jar. Our recommended, science-based processes were determined for food in standard canning jars. No science-based recommendations are available for canning in Weck brand jars or other jars closed with glass lids, rubber gaskets and clamps. Ball and Kerr are only two available brands of Mason-type canning jars. Other brands of canning jars include Atlas, Mainstays (WalMart) and Golden Harvest. All meet recommended criteria; however, we have years and years of experience with jars from Ball and Kerr. Clemson’s packaging experts were asked about using mayonnaise jars versus standard canning jars for canning foods. They commented that the sides (sidewalls) of mayonnaise jars are considerably thinner than the sides of canning jars and that mayonnaise jars are not constructed to withstand the repeated heating and cooling inherent in canning. While glass mayonnaise jars in previous years may have been constructed with heavier sidewalls, these days they are quite thin because they are constructed to minimize shipping weight. So based on the information that I have, using canning jars rather than mayonnaise or other jars is not so much a matter of food safety as it is of preventing breakage, preventing possible resulting burns due to splashing or spilling, and preventing the resulting product loss. The chance for breakage is much higher with non-standard jars such as mayonnaise jars.